Best use of ning.com to put together feeds that I have seen in a while. Fascinating and frightening at the same time. 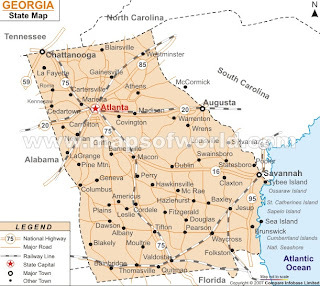 Includes a Twitter feed of those who have decided to ride out Hurricane Gustav. Waterlogged Microbloggers I guess! 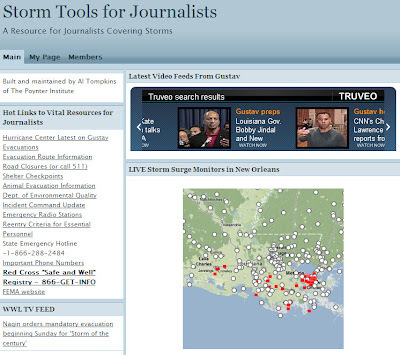 I wonder too whether the live feeds of TV station WWL will be able to stand the strain of so many simultaneous streams. I see the Times-Picayune newspaper in New Orleans decided to drop its requirement to register at the site and just posted the entire Sunday edition on its website. I guess those affected won't have much time to print out their own copy - they've already evacuated. Frankly, unless you've been in the Gulf, you conclude that we really have no idea of what that's like here in Western Europe. This may indeed by a horrible hybrid of Rita and Katrina rolled into one. All the signs are that this isn't the last either. Wonder what it will do to the price of oil? Fingers crossed that there will be no loss of life. Gustav, the way it is spelt here is Swedish, means "staff of the Goths", derived from the Old Norse elements Gautr "Goth" and stafr "staff". This name has been borne by six kings of Sweden, including the 16th-century Gustav. According to the Jamaica Observer I was reading this evening, this year marks the fifth time that the name Gustav has been used for a tropical storm in the Atlantic Ocean. The others were in 1984, when the tropical storm hovered over Bermuda, but caused no major damage; 1990 - Hurricane Gustav threatened the Lesser Antilles but turned away before getting close; 1996 - Tropical Storm Gustav formed west of Africa but dissipated soon after; and in 2002 when Hurricane Gustav came within miles of Cape Hatteras, North Carolina before turning away. 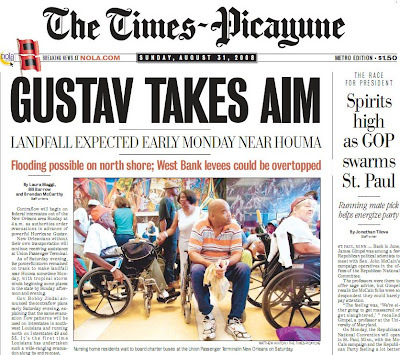 Labels: "gustav" "New Orleans" "hurricane"
In two weeks around 40,000 technical people will be milling around the International Broadcasting Convention at the RAI exhibition centre. Last year, the Mayor's office made a complete fool of themselves by not turning up to the IBC Awards ceremony on a Sunday. Their empty table said everything - IBC is an exhibition and conference not invented here. This year, we're treated to a strange greeting on the IBC website which assumes you'll be coming next year - by which time some of the roads broken up because of the North-South metro line may be almost ready. The city is a building site at the moment, so don't taken Cohen's advice and pay attention to detail, except perhaps the holes in the pavement. It is so crystal clear that the Mayor's office still doesn't understand what the largest trade show in its own city is really all about. I'm not sure anyone will have time for the Concertgebouw. And two of the museums he mentions are indeed opening next year...forget them for the time being. Job Cohen, Mayor of Amsterdam: "Welcome to Amsterdam - The City of Art"
You are - or will soon be - the guest of a very special city: Amsterdam. Whether you’ve been here many times, or whether this is your very first visit - Amsterdam will surprise you again and again. Amsterdam is never less than inspiring, with its many beautiful canals and monuments. There are also the cultural and social riches the city offers in the way of music, theatre, bars, shops and culinary restaurants. In 2009 the Dutch capital will pay tribute to its museological marvels: the opening of the Hermitage Amsterdam and the renewed Stedelijk Museum. Amsterdam has long been considered an influential cultural capital in Europe, with leading institutions such as the Rijksmuseum, Van Gogh Museum, Koninklijk Concertgebouworkest, De Nederlandse Opera and a wealth of history and modern architecture. As Mayor of Amsterdam, I would like to offer you one important tip: have an eye for details! Other world cities may be remarkable for the magnificent and the imposing, but the beauty of Amsterdam very often lies in the subtlest detail. I wish you a very pleasant and interesting stay. and yes, I told them about the strange message, but as usual, no reply. Labels: Cohen "IBC2008" "Mayor's Mistake"
Got an apology through the mail just now about an "inappropriate" newsletter sent out by Schiphol Airport this morning. There was a headline saying "Enjoy yourself in the Canary Islands”. They had a minute's silence in Schiphol this lunchtime to remember the 153 passengers who lost their lives at Madrid airport yesterday. The Spanair flight was also bound for the Canaries. But when I checked this afternoon, the same offer was still on the home page of the website. The advertiser should pick another destination for a while, don't you think? Labels: "Schiphol Canary Islands Apology"
If it really is 8 minutes past 8 pm in 2008 when you past by this blog, then savour this magic moment, just for 60 seconds. It is one of those once-in-a-lifetime date alignments. DJ's used to love them, when they were really live on the radio. 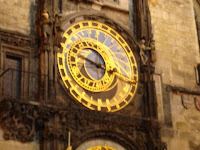 I'm thinking of Prague at the moment, partly because there are all kinds of archive programmes on BBC Radio 4 looking back at the night of 20th August 1968 when the Russians invaded, what was then, Czechoslovakia. Radio Prague has a nice special page up at the moment too, written by good friend David Vaughan. I think the view from Prague Castle over the old city (above) is one of the most beautiful views in the world, especially when there's a slight mist or the snow is falling. In August 1988 I met a Czech writer Jana Beranova, then living in Rotterdam, and we looked back on the events 20 years before, little knowing how quickly things were about the change with the Velvet revolution. Jana was one of those dream interviewees - she was able to give the background to a bunch of recordings I found in the Dutch broadcast archives and those sent in by Media Network reporters. You might be interested in an audio extract from that documentary, which we re-broadcast by request in one of the last radio editions of Media Network. It's an MP3 file and lasts about 14 minutes. Hope you enjoy it. Labels: "Prague" "Radio Free Prague" "Russian invasion"
I kid you not. Call the number and say what you like to the inhabitants of Dalsfjord in Western Norway. Your voice will be broadcast by the Telemegaphone Dale which stands seven metres tall on top of the Bergskletten mountain. 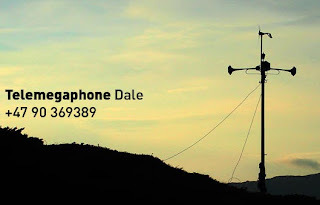 When you dial the Telemegaphone’s phone number the sound of your voice is projected out across the fjord, the valley and the village of Dale below. Telemegaphone Dale is generously supported by Nordic Culture Point, Unsworn Industries of Sweden (who are keeping a blog) and NKD - nordic artists’ centre in dale. Special thanks to Nicklas Marélius, Svein Ove Løseth, landowner Ingolf Viken, and Jörgen Bladh at Kylprodukter i Kivik. Standing ovations, it seems, to Bora Yoon for composing and performing the first ever Telemegaphone Concerto for the opening ceremony earlier this month. It was magnificient to hear her clear voice cut through the mountain mists, accompanied by rainfall and the sound of a chainsaw far off in the distance. The inhabitants of the village hear what you say in the background - although at night I guess it might keep some people awake. The Swedes are going back in a few weeks to see what the locals think of this sound-art project. Time is definitely running out for Worldspace. No new investments, no clear business plan and simply no hope. How on earth can you introduce satellite radio into Italy - the one country in Europe with the oldest population - median age for men in 42, and 20% of the population is over 65? Are people demanding more FM stations in a country that was one of the first to tolerate a rash of commercial stations? Why spend the remaining 1.2 million in the bank? Will the US military buy them out like they did Iridium just before the last US elections? (Update - no they won't because they didn't - see comments) And why does the Worldspace India site still display details of programmes that were aired a month ago...this is not an audio on demand service. As you can hear, too many questions. No Answers. I am just surprised these guys have lasted so long. Will they last into September? 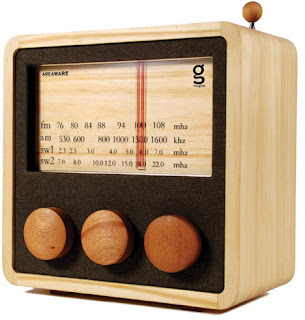 It takes 16 hours to make a wooden radio by hand. That, at least, is the story from South-East Asia. 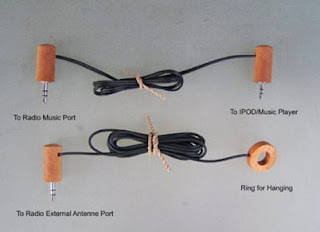 I remember reading about the ultimate minimalist wooden radio designed by Indonesian artist Singgih Kartono sometime last year. I was reminded by a follow-up article in British Airways' Business Magazine this week. 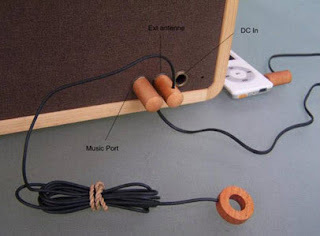 The story wasn't so much about the technology inside (which was simply a good but basic analogue AM/FM circuit in the first model), but the fact that the radio uses sustainably harvested pine wood and palisander/sonokeling. There's no dial...you feel your way across the dial. Designer Singgih (photo below) wanted to revitalize local craft industries, gradually creating jobs for up to 30 people who were making simple high-quality handicraft products. The workshop is in Temanggung in Central Java. Singgih Kartono adds more details about the sustainability side of the project in a company brochure. As a wood consumer, I feel morally responsible towards replacing the woods that I have used. This will ensure that all manufacturing activities that I conducted would not destroy the nature. I do this by re-planting every single tree that I’ve used from the forest. The amount of wood replanted and selected is based on our yearly wood consumption, suitable age for wood to be grown and cut, and the requirement of land per tree. We estimated that for the 40 people we could employ, we could have replanted one to two hectares of land with our selected wood. Currently, Kandangan has almost no forest land. The population is about 4.000 people.If we are to employ the whole population of Kandangan, we will abolish unemployment but most importantly, for every people we employ, we will generate more woods through our forest regeneration programs. Additionally, based on our current income, we receive USD 2.500-3.000 per month; enough to sustain 10 employees. With regards to the forest regeneration, on the top of preparing our own tree saplings, we are also in collaboration with Gunung Sumbing (Mountain Sumbing) junior high school. We work together with the school to create a practical curriculum within the field of environmental generation. Four months ago, the students from this school have helped us to grow trees from seeds. Currently, these seeds have grown into 1.000 young trees that are ready to be planted. We are planning to have these trees replanted around the school area. The students want to have schools that are surrounded by trees. All this activities are funded through a part of our sales income. My production company, Piranti Works, has 30 employees. They are locals. We are in the process of extending our workshop so it is able to employ around 50 employees. They will use only around 50 to 100 trees per year. The remaining 2.200sqm lands that I own are used as a tree nursery, where I will distribute free trees to the villagers. I purposely distribute these trees freely as I want to teach the villagers that the right economy activity will give positive contribution towards sustainable environment. There's a German website, based in Hamburg, that has the distribution rights for Europe. The German language version of the site goes into more detail, explaining that this model weighs 955 grams, and is 19.1 by 11.7 by 13.5 cm in size. It works off 4 AA penlights and the radios are made to order for the price of 149 Euros, plus 5 Euros postage in Germany, Austria and Switzerland. The radios are sent sea mail via Singapore, which takes up to six weeks. A small stock is held in Germany. There will be a slight modification to the radio sets as from mid October 2008. A DC input has been added for a external 3V DC power supply (not included. The new version of Magno radio also has a socket on the back which allows you to connect any MP3 player and listen to it via the radio's mono speaker. Since this is wood rather than plastic, it apparently sounds great (haven't heard it myself). 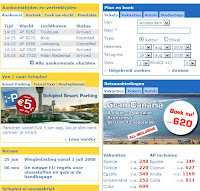 The price then will be around 160 Euros. 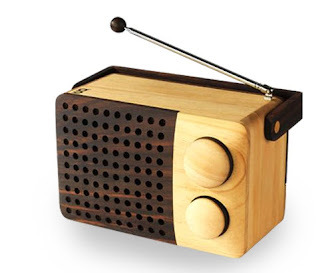 Towards the end of the year, a new "Mango Cube" wooden radio is also due. This has two short-wave bands on it, as well as AM/FM and is supposed to start shipping around November 1, 2008. This one also has a dial - though we're not sure what calibration will be like. A site in the US is now taking pre-orders for this radio at US$250 excluding shipping. This looks like a work of art - and it is priced accordingly. I wonder what sales would be like if they made the price 175 Dollars? UPDATE: Oliver Errichiello in Hamburg, who is the main driver behind the project in Indonesia sent me the following comment after this post was published. "I think it is realistic to say that we will start selling the Cube in early 2009 in Europe. The price will be about 180 Euros. This assumes that the testing and roll out in the USA and Canada late this year goes well. Labels: "wooden radio" "Singgih Kartono"
Just some of the over 300 entries to this years' Association for International Broadcasting Awards 2008. The winners will be announced on November 12th 2008 at a dinner in LSO St Lukes, Old Street, London. Just flown over to Kent to help start the initial selection. Webcaster Pandora to Fade Away? "We're approaching a pull-the-plug kind of decision," says Tim Westergren, founder of Pandora, which builds virtual radio stations for online users. Pandora is one of the nation's most popular Web radio services, with about 1 million listeners daily. Its Music Genome Project allows customers to create stations tailored to their own tastes. It is one of the 10 most popular applications for Apple's iPhone and attracts 40,000 new customers a day. Yet the burgeoning company may be on the verge of collapse, according to its founder, and so may be others like it. "We're approaching a pull-the-plug kind of decision," said Tim Westergren, who founded Pandora. "This is like a last stand for webcasting." The transformation of words, songs and movies to digital media has provoked a number of high-stakes fights between the owners of copyrighted works and the companies that can now easily distribute those works via the Internet. The doomsday rhetoric these days around the fledgling medium of Web radio springs from just such tensions. Last year, an obscure federal panel ordered a doubling of the per-song performance royalty that Web radio stations pay to performers and record companies. Traditional radio, by contrast, pays no such fee. Satellite radio pays a fee but at a less onerous rate, at least by some measures. Yikes, they can't be too far away from CNN Centre. Would that explain why the CNN alert scam seems to be coming out of Russia? When will the Onion reveal the truth? 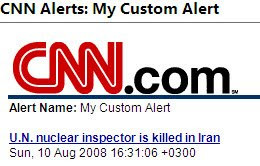 Labels: "Russians West Georgia" "CNN Center"
May be, like me, you suddenly started getting what looked like CNN alerts when you hadn't asked for them. It is spam - and it is not nice. Don't even think of following the links, no matter how juicy the headline. The massive attack that has infected PCs by tricking users into clicking links in fake messages from CNN.com shows little sign of ending soon, security researchers say. According to MX Logic Inc. , spam posing as CNN.com Top 10 lists peaked at close to 11 million messages per hour early Thursday, but remained at high volumes throughout the day Friday. The Colorado security vendor said it had been tracking an average of 8 million messages per hour since midnight. More from PC World Magazine here. Anyone know who originally shot this? Its now forbidden territory and if you watch in full screen you'll see why. This portal seems to require IE-7 - Firefox quickly switches to an error message. Probably to do with the sponsors. But we do have a strange situation here that anyone, anywhere in the world can watch the raw video feeds coming into Geneva from Beijing, but radio stations have to ensure their coverage doesn't go over borders. But I am not complaining. Interesting experiment. A Kansas State University working group led by Dr. Michael Wesch dedicated to exploring and extending the possibilities of digital ethnography. On June 23rd 2008, Wesch gave this fascinating talk about what's on Youtube and why we need to watch what's happening there. 2:00 Numa Numa and the Celebration of Webcams - 58,000 videos uploaded. 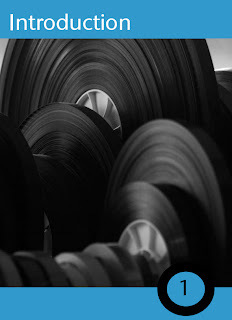 I have at last had a chance to dive into a truly excellent piece of work entitled Tracking The Reel World, which presents the results of a study on audiovisual collections undertaken in the framework of the TAPE project. Based on data collected from hundreds of organizations from all over Europe, most of them archives, libraries, museums (and research) institutes that hold audiovisual recordings as minority collections, this is the first extensive report on preservation and access of sound and moving image materials outside the broadcasting sector and large audiovisual archives. The report shows that a rich diversity of audiovisual materials are held in all types of institutions, but that obstacles in managing them are experienced by many. The study provides estimates on the size of collections, on the presence of specific carriers and their condition. It also presents data on deteriorating materials, obsolete equipment, cataloguing backlogs, and lack of expertise – all problems that are reported frequently. The report, issued earlier in 2008, documents how non-specialist institutions employ new technology for preservation and access of audiovisual materials and concludes that uncertainties about the rapidly evolving digital environment make progress hesitant. Valuable and often unique recordings run the risk of being left behind. The promise digitization holds for easy access and survival of endangered materials can be fulfilled only with more support for minority collections in their transition to the digital world. The report is available as a PDF file, free of charge, at http://www.tape-online.net/docs/tracking_the_reel_world.pdf (2.520 KB). Well worth reading - and the executive summary has some frightening findings. But, unlike other reports, this review also has some practical conclusions. It is not all doom and gloom. Labels: "Tracking the reel world"
Is Twitter and the other microblogs becoming a new newsroom? No. It's becoming a useful alert service for certain parts of the world (mainly US and Europe) and its the source of some fascinating tips and gossip. But it is way too short of analysis to be termed a newsroom. I like the look of what Bond is up to on the web. Great making of videos! I understand why you might want to pay for listening to a comedy series from the BBC back-catalogue on the US audiobook service, www.audible.com. But why would you pay 9 bucks a month to download a podcast of their NewsHour programme, free on the BBC's own site? May be its a ghost that someone forgot? Labels: "BBC Newshour" "BBC World Service"
Kids Podcasting Kit for Africa? I plan to test one of these to see whether it (or something like it) could be useful for a community radio station project in Africa. The kids are looking for something cheap and easy to use in interviewing their parents. The so called "Easi-Speak" lets you record directly into the microphone. The same device can be used to playback remotely or you can download your files straight to your PC through the attached USB. I think the 128MB memory is on the small size, especially if you pick WAV rather than the MP3 format. At the same time, having a limited memory does encourage you to get to the point, rather than trying to save an interview in post-production. The microphone (retailing in the UK for 25 quid) comes with a copy of the Audacity Music Editing Software (this is open source) and it doesn't need a battery, since that is charged through the USB.The good news is that it will record directly into the MP3 format without the need for conversion software and it would appear the buttons are large enough for young children to use. This microphone has been around for a few months, but I see the 128MB version is only just appearing (was 64MB). Thanks to the ever resourceful Podcast Princess, Karin Hogh, in Denmark for the tip. Labels: "Karin Hogh" "Kids Podcasting" "Easi-Speak"
Liking the experience with the MacBook Pro for video editing, but agree with several posts (including Walt Mossberg that MobileMe is flawed. Some nightmare stories of calendar's being erased. My IpodTouch is fine as the link between Windows and Mac. Cloud seeding, a technology developed by American scientists, is achieved by shooting shells or rockets containing silver iodide particles into clouds. The icy particles freeze drops in the clouds, make the drops continue growing and eventually fall out of the clouds. The weather engineering office is weaving a defensive web from adjacent provinces to the Beijing suburbs. Twenty-six control stations have been deployed to fend off clouds or delay their movement. The office hires 32,000 people, and recruits light aircraft, rockets and shells to spread silver iodide crystals or dry ice in clouds 50 km upwind of Beijing. Result estimates can be reported from control stations to the headquarters within 10 minutes. One silver iodide shell costs up to 88 yuan (12.75 U.S. dollars),one rocket is priced at 2,000 yuan (290 U.S. dollars), and one aircraft trip spends much more. About 100 shells or four rockets are used in each single action, according to experts. The office claimed to have eliminated a cloud by airborne spread of infusorial earth on its top on June 2, 2005, which was not found documented in an academic journal. 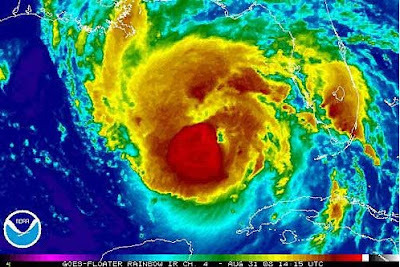 Meteorologists need to capitalize on radars and weather satellites to monitor colossal storms, which are usually unpredictable, and set off early warnings for Olympic weather services. Is man playing "rainmaker" a bad thing to be condemned? No. I'm just curious to see whether it will really work. Remember, the United States started seeding clouds to make rain in the 1950s, but later gave up because they could not work out whether the seeding produced more rain than if they did nothing. There is no reference or control - you don't have two identical clouds, where you seed one and not the other to compare the result. Nevertheless, China now boasts it is the world's leading rainmaker. It has created enough rain during the past five years to fill the Yellow River, the nation's second largest, four times over, Xinhua said back in 2006. Between 2001 and 2005, nearly 3,000 flights triggered 210 billion cubic meters of water over an area making up nearly a third of China's territory, an official from the National Meteorological Bureau told Xinhua. An army of more than 3,000 rainmakers have at their disposal 7,000 cannons and 4,687 rocket launchers to coax more rain from clouds across China. The chance of rain on August 8th looks much higher than the normal average, but there are still 6 days to go. The rain beforehand will bring welcome relief to the current scorching temperatures in the Chinese capital. 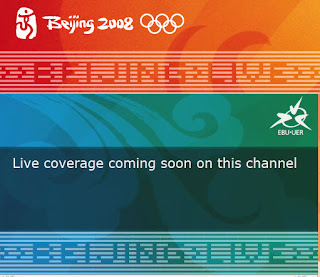 Labels: "weather Beijing Olmpics" "cloud seeding" "silver iodide"
We're not allowed to see anything from Beijing before the opening ceremony. There was an outcry from Chinese bloggers when South Korean station SBS aired a minute of material shot at one of the rehearsals for the opening ceremony on August 8th. I am surprised - I would thought that snippets and teasers would be the way forward. But the BBC is already sharing from the Chinese capital on Youtube. BBC Sport's marketing campaign and titles for the forthcoming Olympic Games are based upon the traditional Chinese folklore 'Journey to the West'. The animation and music were produced by Jamie Hewlett and Damon Albarn. Labels: "monkey olympics" "BBC Sports"